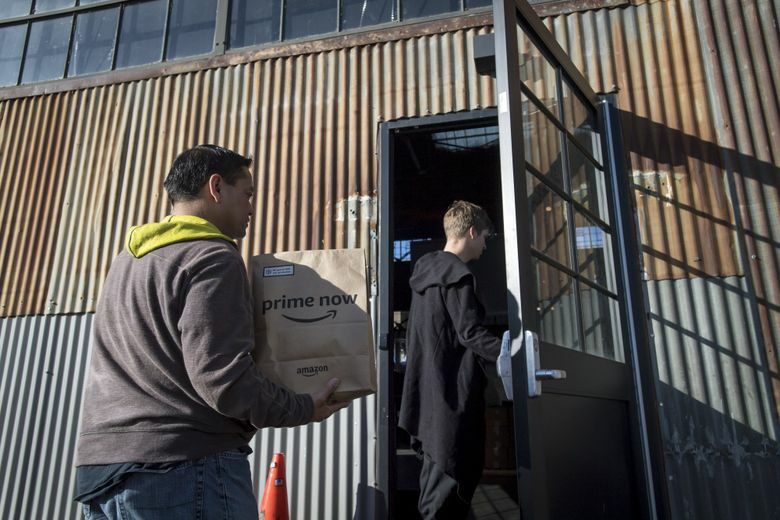 Amazon now has drivers in more than 50 U.S. cities handling delivery of packages, groceries and prepared food in their spare time. But its advertised rate of $18 to $25 an hour doesn’t account for drivers’ expenses, or the time they spend chasing assignments or waiting. After finishing up his day job at a charter school, Sherwin Karunungan heads to a nondescript warehouse in San Francisco that serves as a shipment hub for Amazon.com. In a windowless breakroom, Karunungan presses a single button on his phone, over and over, to request a gig through Amazon Flex. The program lets anyone sign up to shuttle packages for the world’s largest online store using their own cars and get paid by the delivery. But first, they need to score some actual work. On a recent Tuesday night, a crowd of other workers are hunched nearby with their phones, all furiously tapping and swiping to refresh a sparse page of job offers. “Yes! Bayview,” Karunungan shouts. His assignment is about three miles away. “Less driving is good. So, more money for me,” he says. Because workers rely on their own vehicle, pay for their own gas and tolls, and sometimes need to return to the warehouse at the end of the day, a Flex job can feel a bit like playing the slots. And because they’re required to make the deliveries in a narrow window of time, Karunungan jumps up from his chair and hurries to retrieve his orders and load them into his car. Amazon depends on a patchwork of government postal workers, international shipment operators like UPS and FedEx, local carriers and its own armada of warehouses, planes and trucks to deliver packages as quickly as possible to customers. Amazon Flex is one of the newest and largely unseen additions to this network, but it already has people in more than 50 U.S. cities handling packages in their spare time. The company’s sprawl and its relentless drive for efficiency — sometimes at the expense of its own labor force — make it a target for critics. Beating up on Amazon is one of the few bipartisan platforms in American politics, drawing the ire of both President Donald Trump and Senator Bernie Sanders. On Nov. 1 Amazon raised the minimum wage for all U.S. employees to $15 an hour, a move that was seen as a response to political pressures. The company said it’s also giving raises to every operations and customer-service employee in hourly jobs, including part time and temps. Flex workers are not eligible because they’re contractors. Amazon advertises an hourly rate of $18 to $25 for Flex. But interviews with Flex drivers and research by financial analysts at Bernstein indicate the net pay is much less when accounting for essential, on-the-job expenses. Actual earnings are $5 or $11 an hour, depending on what a worker chooses to deduct, Bernstein found. The calculation assumes a driver makes tips and records certain work-related costs, such as fuel and tolls. Two drivers say their pay fell within that range. Seven others who spoke to Bloomberg say they never bothered to do the math. “Most of these Flex drivers have no idea — they do not realize that they’re making considerably less and working considerably more than what Amazon quotes in the app,” says David Vernon, an analyst at Bernstein who worked on the report. An Amazon spokeswoman disputed the findings by Bernstein, which the firm distributed to hedge funds and other clients in May. The study relies on “flawed assumptions and anecdotes versus real data,” the spokeswoman wrote in an email. “Their narrative does not accurately reflect the experience or earnings of the overwhelming majority of independent contractors who deliver packages with Amazon Flex.” She says the average driver makes more than $20 an hour but declined to provide an estimate that accounts for expenses. When things go smoothly, Amazon Flex is a novel and enjoyable way to make some extra cash, drivers say. But they also describe the job as demanding and wildly inconsistent. The process for applying and acquiring assignments is time-consuming and some days results in no work at all. Telephone-support representatives are tough to reach and often unhelpful. Package runs are timed, and workers are kicked off the system for missing delivery windows, which creates an incentive to run red lights, double-park and go over the speed limit, drivers say. After an assignment, Flex workers are sometimes required to bring goods they were unable to deliver back to the warehouse. The trip is unpaid and can take an hour or more but is necessary to stay in good standing with the company. Amazon suggests it leaves drivers plenty of time to complete their routes safely. 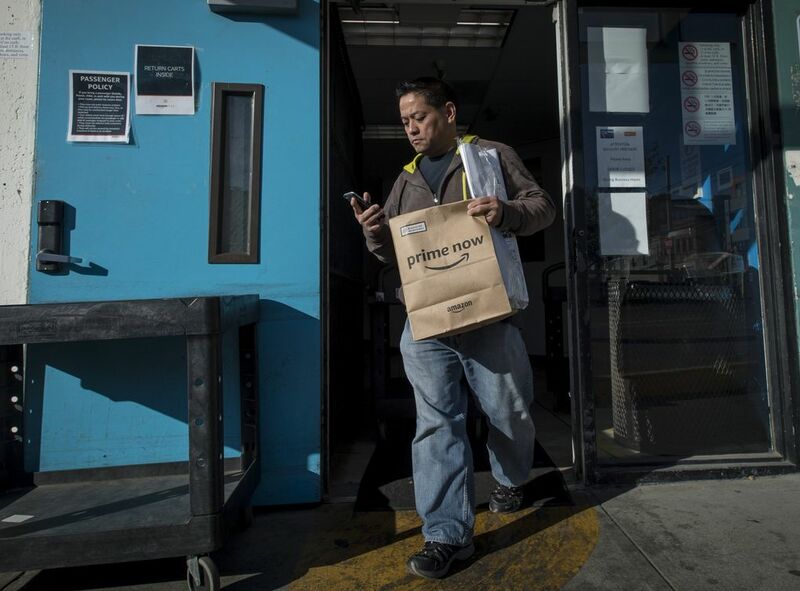 The company says more than half of Flex workers finish their assignments with at least an hour to spare, including those who need to return undelivered packages to the station. While shuttling a parcel of laundry detergent, kale chips and LaCroix in his Honda Civic, Karunungan offers some tips he’s picked up from his time on the road. Amazon asks Flex drivers to deliver groceries from Whole Foods and meals from restaurants, but he usually picks orders from the warehouse because he says they pay more. Above all else, he says, Flex drivers need to move fast. Amazon Flex arrives in a city practically overnight, with little notice or fanfare. When Karunungan found Flex — after his daughter’s interest in medical school inspired him to look for extra work — he was drawn to the prospect of making as much as $25 an hour. Applicants must download an app, submit to a background check and watch 19 instructional videos explaining what to do if you’re given an incorrect address or damaged package. Nowhere in the lengthy training does Amazon provide guidance on expenses or taxes, according to nine drivers who went through the curriculum. “It’s outrageous that a company like Amazon requires these contractors to sit, unpaid, to watch detailed videos on how to make deliveries, on how to scan packages at every step of the process, but does not give some simple guidance on how to account for expenses,” says Veena Dubal, an associate professor at University of California Hastings College of the Law who specializes in employment issues and the gig economy. After a waiting period that can last weeks, Amazon emails a welcome letter to those who pass the test. Getting work is a whole other challenge. With Uber, Lyft or other on-demand services, drivers can log on and get to work right away or idle near home until a gig is available. Amazon asks Flex workers to pick the jobs that suit them from a list in the app and tap a button to refresh if the options aren’t to their liking. Oftentimes, the page is empty. So, they tap and swipe to refresh. And tap again. Eric Carter Jr., an Amazon Flex driver from San Jose, California, says he has more luck during off hours. He wakes up at 3 a.m. to get ahead of the day’s shifts — or “blocks,” in Flex parlance, because Amazon pays per block of time. They’re not paid for time spent waiting for an assignment. Amazon says Flex workers in some cities can avoid trips to the warehouse by picking food or grocery orders. On a good day, he guesses his net hourly pay is $20 after expenses but admits to not keeping tabs on what he spends. This Monday, however, was not a good day. Delivering packages is traditionally a pretty good way to make a living in America. United Parcel Service pays about $36 an hour on average, with transportation, gas and tolls covered, according to the Teamsters, a union that represents some 260,000 UPS workers. The American Postal Workers Union says employees make about $75,000 a year, well over the median U.S. income. Yet, even at the high end of Amazon’s advertised rate, Flex workers would make far less than that and get no employment benefits. Seven of the nine Flex drivers who spoke to Bloomberg estimate their net income at $20 to $25 an hour but say they don’t give much attention to expenses. The other two drivers, who say they do track spending, report earnings below minimum wage. Vernon, the analyst, says his research was based on interviews with drivers, most of whom delivered boxes, as well as information collected from online chatrooms, forums and other posts. The study says that within a four-hour block, workers can expect to spend more than an hour going back and forth to the warehouse picking up boxes or returning undelivered ones. 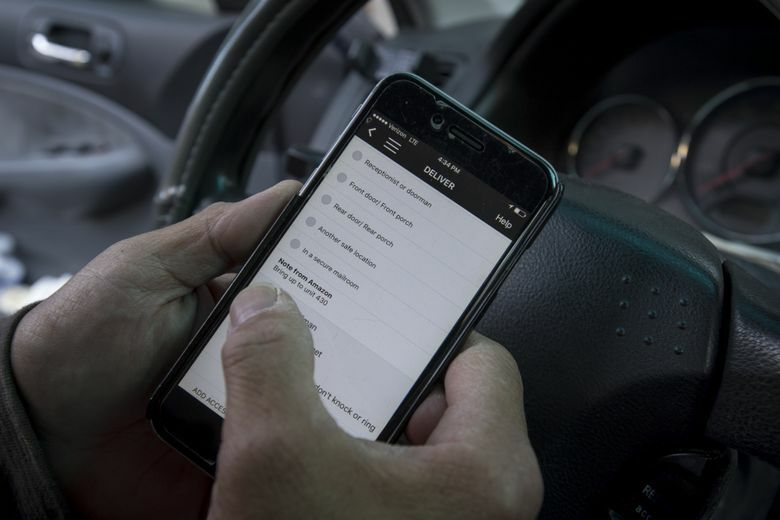 This contrasts with other on-demand contract work like ride-hailing, where drivers start and stop the clock anytime and from practically anywhere. When factoring in this unpaid time with Amazon Flex, as well as the full gamut of expenses associated with the job, including vehicle depreciation, insurance, maintenance, mobile phone fees, fuel and tolls, net earnings can approach $5 an hour on average, Bernstein says. Only deducting for gas, tolls, and half their insurance and maintenance costs, hourly pay works out to $11, the study says. Amazon says it covers Flex drivers who hold personal auto insurance under a commercial insurance policy. 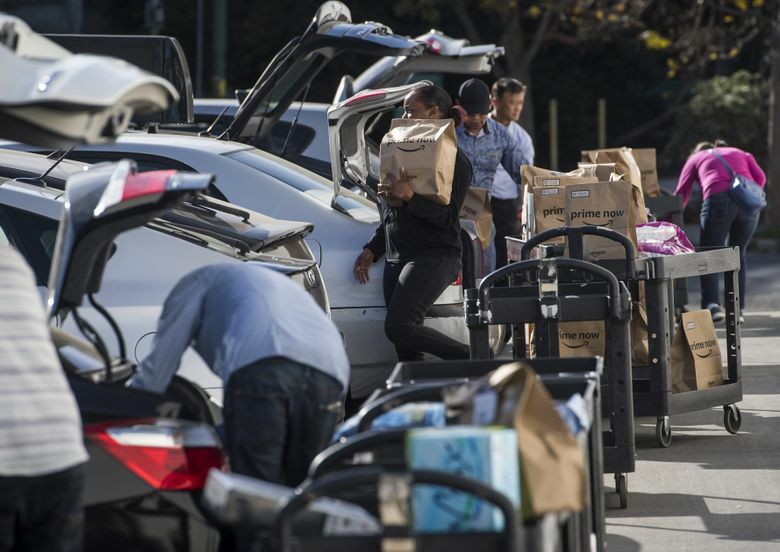 It also says most deliveries are completed on the first attempt and that less than a quarter of drivers are required to bring items back to the warehouse. The acquisition of Whole Foods last year for $13.7 billion gave Amazon more than 470 additional stores from which it can stow, package and deliver goods to online shoppers. It has already begun to leverage parts of that logistics opportunity this year. Bernstein says Amazon is building infrastructure to route 5 to 15 percent of all packages through a Flex driver. The company declined to comment on the size of its contract workforce. Stephen Anthony left his job as a data specialist for T-Mobile in Renton for Amazon Flex because it allows him to spend more time with his daughter. He drops her off at his in-laws’ house on the way to the warehouse and works fewer hours than before. The financial costs of the work aren’t a major concern for him right now. Amazon pays Flex workers twice a week via direct deposit to their bank accounts. Jodi Lynn Reeves signed up for Amazon Flex in Kansas City, Missouri, after she left her job at a company that collects coins from laundromats and struggled to find steady employment. She says she’d get a buzz when the money from Amazon would appear in her checking account every few days. But after two months, Lynn Reeves realized she was earning just $5.50 an hour driving long distances and paying tolls to deliver packages in her Ford Expedition, which gets about 13 miles per gallon. She estimates her fuel and tolls cost $50 for a four-hour shift and pushed her net income well below the U.S. minimum wage for employees, which is $7.25.